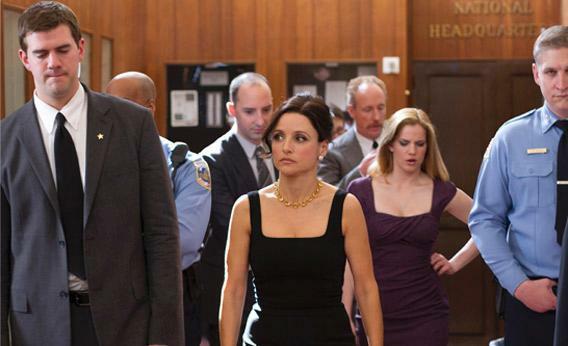 HBO’s Veep reviewed: Julia Louis-Dreyfus plays the vice president. In HBO’s Veep, Julia Louis-Dreyfus plays the vice president as a personality in search of a cult. Related in Slate: A conversation with Armando Iannucci. Armando Iannucci’s Veep (HBO, Sundays at 10 p.m. ET)—ruefully amused and regularly amusing—stars Julia Louis-Dreyfus as the vice president of the United States. The farce busies itself with filibuster-reform failures and a clean-jobs-commission hassle. But where Iannucci’s earlier comedic explorations of government (BBC’s The Thick of It and its big-screen spinoff, In the Loop) directly concerned themselves with the substance of politics, Veep focuses on style, on mangled image-management and interpersonal bumbling. This is appropriate both to the nature of the No. 2 job—famously, a gig not worth a pitcher of warm piss—and to the facts of public service in 21st century America. As any random rerun of Seinfeld will remind you, Louis-Dreyfus is a veritable poetess of neurotic vanity. Here, when her character, Selina Meyer, gets word that the POTUS has suffered a heart attack, her face tickles you with its hopeless attempt to stifle a pulsing expression of giddiness beneath a mask of gravitas. Meyer is a pure incarnation of Beltway narcissism and fake-smiley realpolitik. Much of the time that we spend in her company ticks by at cocktail parties where she anxiously glad-hands, and at photo ops where she condescends to visit with, in the words of her director of communications, “the normals and the normalistas.” She’s a personality in search of a cult. Meyer surrounds herself with staffers engaged, perpetually, in a grandly silly verbal slap-fight of all against all. At a key moment in each of the first three episodes, she literally surrounds herself with them to put a human shield between herself and the Fourth Estate. In the pilot, after publicly using the word retard, she rings herself with these delightful incompetents to escape questions about the matter. In the second episode, struck with a stomach bug, she directs them to circle her as, clammy and heaving, she heads into her limousine for a discreet session of operatic antiperistalsis. One gets the sense that such calamities befall Meyer all the time—that damage control represents her central professional goal. Scholars of filthy language—meaning both Ph.D. linguists and enterprising middle-schoolers—will want to study the agile profanity of Veep’s dialogue with Talmudic intensity. Iannucci (writing with Simon Blackwell, among others) has a great ear for rhythmic invective and withering insults. He may well be the Werner Von Braun of the F-bomb (to use that euphemism that Meyer stiffly employs in front of her college-aged daughter). There is, perhaps, something lightly sour in all of this—in the absurdist bumbling of Tony Hale as Meyer’s body man, in the alpha-dork posturing of a West Wing liaison high on his own idea of his status, in the backroom rivalries that play like school-cafeteria spats. Iannucci’s earlier political comedies played for human emotional stakes and glared hard at the marketing of a war. But it takes a kind of passion to be thus engaged. Only a former idealist could communicate In the Loop’s aches of disappointment. By contrast, Veep is post-political from the jump. A double-headed running gag finds Meyer repeatedly asking her secretary if the president has called (he hasn’t) and Meyer repeatedly extracting herself from conversations by pretending that the president has called her BlackBerry (he hasn’t). Worming through the core of power politics, Veep tells you that the core is not just rotten but hollow. We laugh at its slapstick cynicism, but nothing and no one is on the line.